Not a rock artist for any length of time, but rather a veteran musician who was either recruited by Decca Records to cut rock songs in 1949 in an effort to capitalize on the music’s growing popularity, or else he was someone who felt his own fortunes might be improved if he learned how to rock. It didn’t last long but his most notable effort was reasonable in its attempt. Doles Dickens (sometimes shortened to Dole Dickens) was born in 1916 and began playing bass for jazz bands in the late 1930’s. 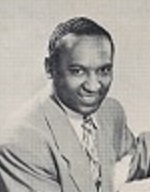 He first recorded with Eddie South’s band in 1940, was a founding member of Steve Gibson’s Five Red Caps, a vital pre-rock outfit, though he didn’t stay long, and mid-decade he formed his own group with little success on record. They were seen as being reasonably well-suited to a major label’s condescending view of rock ‘n’ roll however and so in spring of 1949 they were signed to Decca Records where they covered two recent rock hits which made up their first single. They stirred little interest, other than years later from a strictly historical perspective, and their later releases were more in a novelty pre-rock vein, though they did try once more to latch on, if only tangentially, to rock ‘n roll with 1951’s “We’re Gonna Rock This Morning”. By now there was little chance for mistaking them for the real deal and they were cut loose, though Dickens did continue to record some under his own name as well as doing sessions behind others. After leaving the playing to others by the end of the 1950’s he moved into arranging and production before dying, still fairly obscure, in 1972. His legacy however, such as it is, stems almost entirely from his brief flirtation with rock ‘n’ roll as leader of one of the first major label cover bands to infiltrate rock music.